Air Handling Systems ships products worldwide on a regular basis. Please forward your list of material and location of freight forwarder in the United States. We will quickly provide a quotation including the freight cost to US forwarder. It is the responsibility of the customer to arrange transit from that freight forwarder to their international location. Size and weights of shipping cartons will be provided. All necessary export documentation will accompany shipment. Contact us anytime for product prices, shipping fees and estimated delivery times. 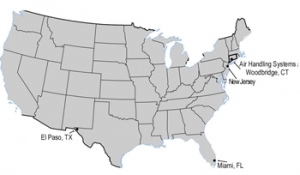 Product prices and delivery charges may vary when shipping outside the continental United States. Recipients may be responsible for paying duty and taxes. Phone/Fax – When calling from outside the United States, call 00.1.203.389.9595 or fax 00.1.203.389.8340. 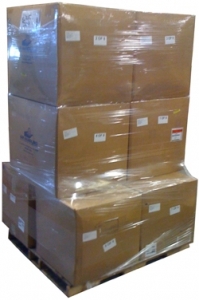 Eight cardboard cartons (28″ X 25″ X 26″ each) shrink wrapped. Working with UPS, FedEx Ground, United States Postal Service, and many local, regional and national trucking companies our knowledgeable shipping department will ensure your shipment goes by the most efficient and economical way possible. Standard shipments of fittings, hoses, accessories and 5 foot lengths of pipe normally will ship in cardboard boxes specially designed to maximize length, width and girth. 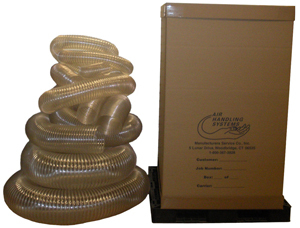 Larger shipments may require special packaging to protect your shipment. These containers are available for additional costs which will be discussed upon placing your order. Shipping lead times and costs vary greatly please contact us for more information. E-Mail:sales@airhand.com or call 00.1.203.389.9595. View more details on shipping. We are located in Woodbridge, Connecticut which boarders New Haven, home of Yale University. We are approximately 60 miles northeast of New York City and freight forwarders located in nearby New Jersey. In addition we commonly ship to freight forwarders in Florida, and Texas. You may be subject to import duties and taxes. Customs policies vary widely and you should contact your local customs office for additional information. Incoterm: EXW – Ex Works Air handling Systems, Woodbridge, CT 06525. The seller makes the goods available at his premises. The buyer is responsible for all charges. This trade term places the greatest responsibility on the buyer and minimum obligations on the seller. EXW means that a seller has the goods ready for collection at his premises (Works, factory, warehouse, plant) on the date agreed upon. The buyer pays all transportation costs and also bears the risks for bringing the goods to their final destination. We accept credit card and wire transfers (US Funds). Pro forma Invoice will be provided per your request. Credit Cards: We gladly accept American Express, VISA, and Master Card. Wire Transfer (US Funds): Contact us for wire instructions. Air Handling Systems by Manufacturers Service Co., Inc. has a long established NO RETURN POLICY, based on Cross Contamination Dangers, examples of which have been highlighted in the news headlines recently. Air Handling Systems does not accept for return, any material that has left our facility. There is always the possibility of contamination from an unknown source. When component parts are delivered to your location, they generally are placed in the area where dust or fume contaminate will be collected. This allows dust or fumes from this location to migrate into the packaging and onto the ductwork, as parts may have been left unpacked in the area. Some components could have been temporarily installed, further tainting them. Air Handling Systems by Manufacturers Service Co., Inc. also has a long established NO RETURN POLICY, for ALL Custom Fabrications. Custom items are made to your specifications, they are not returnable for any reason. Orders cannot be cancelled or changed once production has begun.